Columnists Jason Riley of the Wall Street Journal and Nicholas Kristof of the New York Times spoke about ideological diversity on college campuses and its effect on freedom of speech before a crowd of students and community members on Monday evening. Although President Clayton Rose and the committee of students and faculty who planned the event designed it with the intention of opening up “vigorous discussion” on “difficult critical issues” and allowing students to hear different perspectives, many students felt that the speakers did not strongly challenge each other’s viewpoints and did not sufficiently address issues of free speech with reference to colleges like Bowdoin. The event, entitled “Up for Discussion: Political Correctness and Free Speech on College Campuses,” was organized by a small working group of students, faculty and staff last fall. The topic was determined based on the results of a survey of Bowdoin students last December. Associate Professor of History and Environmental Studies Connie Chiang moderated the discussion. Both Kristof and Riley agreed that colleges often do not expose students to enough ideological diversity, but somewhat disagreed about who should be responsible for increasing this diversity of thought. Riley expressed a similar sentiment. “[The mission of the College should be] to get kids out of their comfort zone, allow them to develop their critical thinking skills, argue with people, debate people, learn that saying ‘I’m offended’ shouldn’t end an argument … learn how to analyze an issue from different points of view, because I don’t think you’re doing the kids any favors by letting them exist in this bubble,” said Riley. Riley added that he feels the responsibility for lack of ideological diversity falls on faculty and administrators. To this point, he argued that colleges need to encourage liberal professors to teach objectively. Kristof suggested that all individuals have a role to play in seeking out ideological diversity. Student reactions to the event were mixed, and many expressed frustration or disappointment. Many hoped for more disagreement and debate between the speakers. Other attendees commented on the lack of specificity in the discussion. Neither speaker nor the moderator addressed free speech at Bowdoin specifically. Although Wozniak said the talk could have been improved, she expressed gratitude toward the speakers. “It was still very incredible to have them both come,” she said. Rebkah Tesfamariam ’18, a member of the committee that organized the event, was satisfied with the outcome. Chiang asked questions to the columnists for the first 45 minutes of the event. 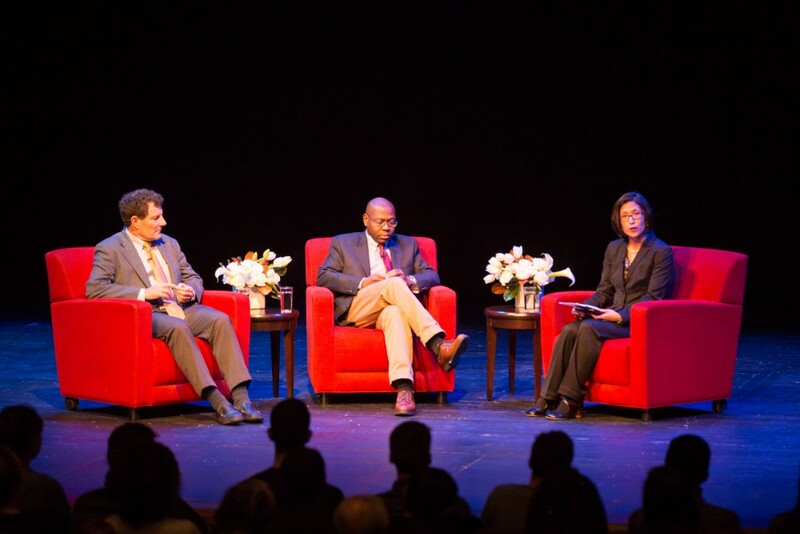 During the final 30 minutes, the speakers responded to questions from students in the audience. After the discussion in Pickard Theater, about 200 students discussed the event in small groups in Thorne, joined by Kristof and Riley. Many students responded positively to this post-event discussion.